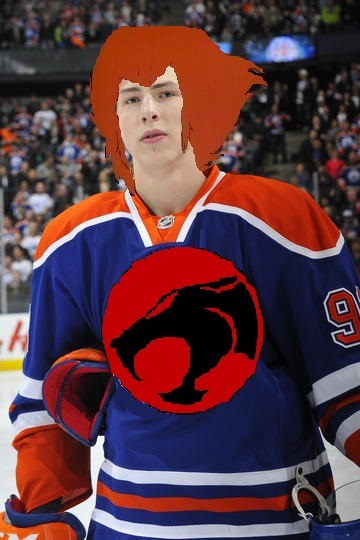 Earlier this week, I mentioned that I refer to Oilers' centre Ryan Nugent-Hopkins as Nug-Ho rather than his current nickname ("the Nuge"). Here's my justification, which I hope will turn into a grass-roots movement to re-christen him. I'm against calling him "the Nuge" because it only reflects half of his name. Since he's pained the people responsible for stitching his jerseys, announcing his goals, designing his trading cards, etc. by insisting on having two surnames, his nickname should reference both. Moreover, we already have enough "ooh" sounding nicknames, and they're going to cause some confusion when running into each other. How are we going to tell if fans are cheering "Looooo" or "Nuuuuge" during a Canucks-Oilers game? Also, it's impossible for TV viewers to tell if the long "ooh" sounds are cheers or boos. Since the Oilers have given their fans much to boo about this year (like when they were beat soundly by the Flames 4-1 last night), their fans would voice their occasional support more clearly if they started chanting (like a company of galley slaves) "Nug-HO! Nug-HO! Nug-HO!" Nug-Ho would also, I hope, remind people of The Thundercats--a cartoon that aired in the late 80s, coinciding with the Oilers' heyday. (Who doesn't remember "Thundercats, Ho!"?) So the proposed nickname at once nostalgically alludes to a happier, simpler time in Edmonton's hockey history, and it also "lionizes" the current team by comparing them to the most influential group of feline superheroes in history. 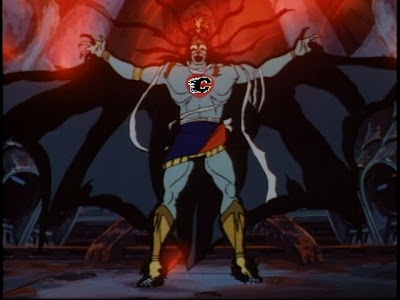 With that, Nug-Ho also gives Oilers fans a chance to characterize their closest rivals in terms of the Thundercats' enemies. "Ancient spirits of evil, transform this decayed form to Miikka the Everliving!"